Finding Success and Meaningful Work: Does Your Career Need To Be Reviewed or Renewed? As I have traveled along my clients’ career journeys and my own I have noticed that we often do not take or make the time to truly evaluate our careers. It doesn’t matter if you are an entrepreneur, a corporate C-Suiter or just starting your first job—you must find the time to audit yourself! I suggest that you audit your career quarterly—about every 2 to 3 months depending on what your goals are and how you are feeling about your career. Like life, there are the regular patterns of career growth, success and meeting your goals. Some things you have control over and other things you do not. Being able to review and renew your career on a regular basis keeps you on track and able to withstand any changes and things you do not control like the economy, your boss, being fired or your clients going out of business. With ALL of the changes that happen, you need to make the time to plan, strategize and manage your career journey because nobody else can. As a career coach, I remind, review and keep my clients focused on their need to monitor their career, but I cannot and do not do it for them. The increase of competition is in EVERY sector across the board. There is the globalization of the workforce, technical innovations, increased competition among workers and less opportunities and demands from consumers, which have all contributed to making today's work environment an unstable one. Career success, growth and advancement are no longer guaranteed, your business isn’t always going to do well and neither is job security. There was a time where doing a good job, having a business plan, and moving up the ladder of success was easy if you just did what was expected or what you were told—that is no longer the case today. Instead, it's necessary for each of us to consider ourselves as independent consultants of our careers. In order to succeed, you MUST stay ahead of the curve in your industry, the latest social media practices and software, keep your skills sharp, certified, current and in demand. There are some companies that do onboarding, career planning, and assistance, but those services are usually when you first begin as a new-hire or when you reach the upper ranks of a company. For those of us who are entrepreneurs—you are the one who needs to do this for YOU and your employees. Those of you who work in organizations without an HR department or even have one, but they do not provide these kinds of services, like business owners you too are really on your own. 1) Is the work I do everyday meaningful and impactful, and gets me out of bed every morning? Your answer to this question is most critical because it affects your mental health and well-being. Your attitude, work ethic, loyalty, commitment, and personality are all negatively impacted if you are not fulfilled and genuinely like what you do. This is something ONLY YOU can do something about. You never want to just be counting down the days until vacation, your pension, or even until Friday. There are going to be tough times and days you want to quit, but if you LOVE what you do you will get through it. 2) Based on how valuable my business and/or position is to the company, is my job or business developing or diminishing? If your field is diminishing, you should consider getting the necessary training to shift your vision. Your business or job may quickly become expendable as a result of a decreasing market. If you are a job seeker or looking to start a new business, investing your time on a field that is no longer in demand is simply a waste of time. Are you making a profit? Do you affect the bottom line? Are your skills critical to the company's success? If you answer NO, you need to figure out how to add value to the goals of the business. 3) Is my business and opportunities for professional development growing as expected? Am I making what I am worth? This is the area where YOU have the most control. If your business is making a profit, your customer base is growing and you are getting rave reviews from your current clients then you’re on the right track. If this is not the case, then you might need to figure out a new marketing plan, shift your focus or even your business. As an employee, if your company wants to invest in you professionally, and you are being given opportunities to develop your career, and you are being compensated fairly EXCELLENT!!! If you're not being given these opportunities or salary increases, ask yourself why not and ask for more responsibilities, find problems to solve and volunteer for projects where you can take a leadership role. Make the time to audit your career! Whether you do it alone, with a friend or a career coach—focus some time quarterly to review and renew your career objectives. The more time you spend on planning the more control you will have over your career. Stay ahead or in the know of any changes in your industry, and take the time to keep your skills up to date. As women we MUST always ask for what we want, take risks, and believe in our success—YOU and YOUR career are worth it! Go after your DREAMS as you reach each GOAL and SUCCESS will be YOURS! Note: You have to be registered for the Black Enterprise Entrepreneurs Conference to attend this private event. 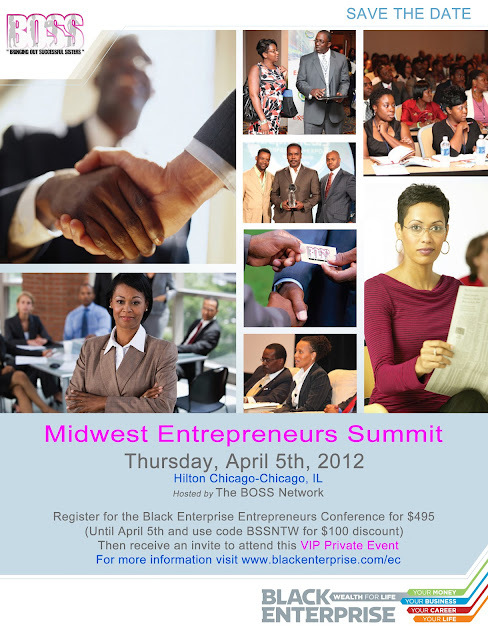 Once you register using discount code BSSNTW (save $100) you will receive a invite from The BOSS Network.